The concept of “networking” to build a sphere of influence shouldn’t be applied only to agents and prospective clients. Networking among other agents is a highly valuable way to gain industry insight, swap best practices, and learn what marketing tactics and technologies consumers are demanding. Throughout every year, the industry gathers at an array of professional events, some quaint and selective, others communal and celebratory. Whatever the tone, real estate conferences provide agents an outlet to share new ideas and recharge their approach to business. Adwerx has summarized here a number of diverse upcoming industry events to consider for your Summer/Fall 2018 calendar. Find one you like? Better register quickly, because the industry is changing by the day, and events like these help everyone keep a finger on the pulse. More agents are working alongside investors these days, especially in an ever-tightening market and an influx of overseas buyers. Primarily for agents who advise large-scale, institutional investors, this event is all about learning data standards and policies your clients need to know. These bi-annual events have become centered on the agent, from encouraging radical thinking from outside industries to introducing bleeding-edge tech that is only weeks from cutting-edge. Terrific speakers, lavish parties, and a never-ceasing agenda characterize Inman Connect. You don’t have to be a devotee of real estate coaching to get something out of attending a Tom Ferry event. However, after attending, you may find you’ll want to make this event an annual tradition. Meet countless top producers and find a way to harness the inner sales champion you know is in there. Everything’s bigger in Texas, including the ideas on how to keep the Lone Star state in the forefront of the industry. From innovative ways to empower agents, to dealing with an ever-speculative economic picture, this is the place to be for Texas agents. ‘Tis the season for state association events, and Tennessee agents will be flocking to Knoxville to brush up on continuing education, meet their new officers, and toast the final quarter of the year. Come and find a way to finish 2018 on top of your market. Agents in the Old Dominion will be heading to the coast to hear top speakers address issues and introduce strategies when dealing with one of the country’s most expensive and diverse metropolitan markets. Plus, it’s a ton of fun. Network and brainstorm among current and future real estate industry leaders at the National Association of Gay & Lesbian Real Estate Professionals 2018 conference. Learn from dynamic speakers and soak up a few days of southern California sun before fall takes hold across the country. The entire state focuses on the state’s busiest port city for three days of strategy and updates, and to hear from some of the industry’s most influential trend-setters. This year’s theme is “REimagine!” and it’s tapped to be all about innovation and what’s next for Golden State Realtors®. Smaller than Connect, but no less empowering, and all about what it takes to sell and service the luxury real estate market. In what other city could such an event be held? The fall conference season wraps up in spectacular fashion with the big one in Bean Town. Join agents from every state and major market to hear what the industry’s top brass has in mind for the future. It’s an unclear picture, and this show should provide the clarity needed to charge into 2019. 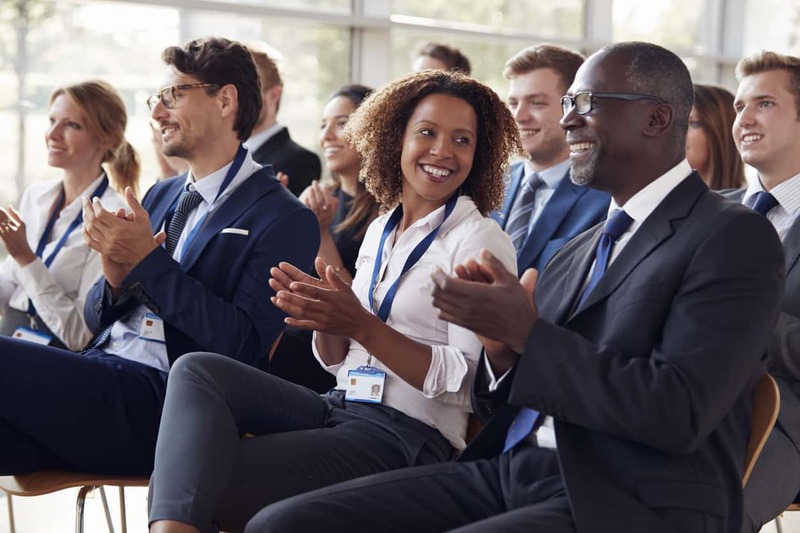 Whatever conference environment best suits you, remember to stock up on business cards and questions, because whenever real estate agents are together in large groups, rest assured you need an ample supply of both to survive the event. And when you get back, your best, first step will be to make sure your new contacts know how deft you are at marketing. Enter new email addresses into your Adwerx Sphere account to ensure you’re referral ready, and that industry vendors will want to work with you.